This post and giveaway is sponsored by NCircle Entertainment. This post also contains Amazon Affiliate links. One of the things that our family loves to do over the holidays is watch movies. We don't watch tons and tons during the regular year, but during December we love to cuddle up on couches, grab hot cocoa and treats, and watch our favorite old (and new) movies. We also love to give DVDs as gifts to our kids and to family members and friends. 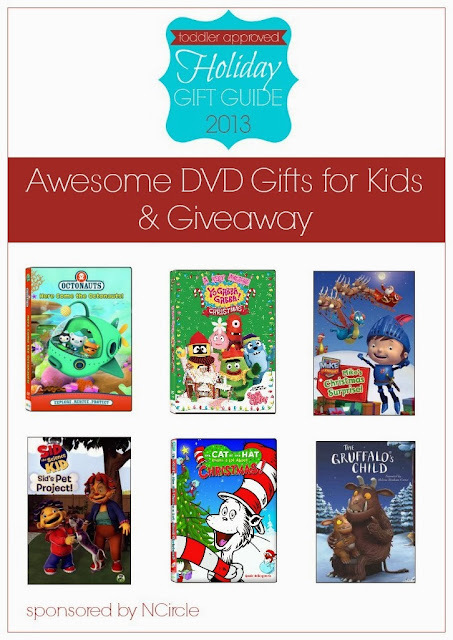 Today's featured gift guide is filled with a few awesome DVDs that we've been enjoying at our house lately (and a few others that we've shared before or enjoyed in the past)! Scroll down to check out our DVD giveaway and Mike the Knight inspired Christmas Tree Advent Puzzle. The DVDs featured above are ones that have been enjoyed by my almost 3-year-old and my 5-year-old. You can click on the links below to learn more about the DVDs or read our quick thoughts below each link. My kids really enjoy watching the Octonauts and think the characters are a hoot. I like that they learn cool things about ocean animals, habitats, and lessons about being good friends, working together, and helping others. This video has six action packed adventures and right now it is being sold exclusively at Toys R Us until its release in January. Octonauts get us all excited about the ocean. We have 11 ocean themed activities & crafts that get kids learning and creating if you want to dive in a bit deeper after watching this movie. We have watched Yo Gabba Gabba since my son was about 18 months old (he is now almost 6). Honestly, my husband likes it just as much as my son does. The songs are goofy, teach great lessons about sharing/giving and making new friends... and the characters are pretty rad. We even have a few Yo Gabba Gabba stuffed animals at our house because they are loved so much. This DVD has two episodes and features Santa as a special guest! We are always looking for new resources to help us make friends and be better friends. Here are some tips for having a successful playtime with friends over the holidays. You may even want to heart attack a friend this holiday season and show them how grateful you are for them! We featured Mike the Knight: Knight in Training over the summer and were excited that this new holiday DVD just came out!! This video is one that the kids ask to watch daily... if not hourly. Mike has to work super hard to help save the day when their family game turns into an adventure they need to escape. We had so much fun with Mike the Knight that we even have a special activity to share with you in this post inspired by the movie! SCROLL DOWN to check it out. We'll also have another one next week to share with you. You can print off a Mike the Knight Coloring page from NCircle's FB page if your child wants something fun to do while watching movie. Sid the Science Kid is a beloved show. Sid is always trying to figure out how things work and learn new things. We really enjoy watching his adventures and learning from them. My daughter is obsessed with animals... especially dogs, so she really enjoyed watching Sid learn to take care of his Grandma's dog (while also trying to convince me we need a dog). Sid's Pet project will be released on December 3rd though you can pre-order it now. If your child loves puppies, they may also enjoy trying out these dog activities & crafts. My favorite ones is the dog hat. The Cat in the Hat always goes on the craziest adventures. We are always looking for new movies to watch over the holidays to get us in a Christmasy spirit. I was so excited to add this one to our collection this year! We have a lot of disagreements over movies at our house (my son thinks he is too cool for some of the ones my daughter likes), but both my kiddos enjoyed this one. If you want to try some Christmasy activities before or after you watch, you may enjoy making some of these 10 simple homemade Christmas ornaments. We've shared our love of The Gruffalo and The Gruffalo's Child with you before. I love the wintery backdrop of The Gruffalo's Child, so I think it is another perfect movie for December and January. You can buy The Gruffalo and The Gruffalo's Child in a set or separate. I personally recommend buying the books by Julia Donaldson along with the DVDs. The images are gorgeous and the characters are endearing. I have loads of Gruffalo activity ideas if you want to try some before or after you watch the movie. Alright... so sometimes after we watch a movie... I just want to watch another one (like last week when we were all sick and super tired). Normally though we are inspired by the movies that we watch and once they are done my kiddos are raring to go create or re-enact part of the story. After we watched Mike's Christmas Surprise, my kids and I wanted to make our own adventure! Mike and his family played a game in the movie and magically found themselves trapped inside it! They solved their problem and did a puzzle along the way. Inspired by MTK, we decided to create our own puzzle! Our Christmas Tree Advent Puzzle can be used in three ways. You can choose how you want to use it... but I am going to first show you how we made it! First I created a giant tree with green tape on our floor. You can do this on carpet or wood/tile. Then I laid out cardstock in patterns on top of the tree and drew lines and cut to make the paper fit within the tree outline. I wanted to make 25 different pieces, so I just played around with the paper and sizes until everything fit. Once all 25 pieces were cut and labeled, I wrote an advent activity on the back of each piece with a pen. The kids helped me brainstorm! Here are 25 holiday activities that we want to try and do before Christmas... we'll see if it happens. If not, oh well! 18. Make thank you treats for teachers! 20. Go and visit family! Since it isn't Christmas yet, we decided to laminate our puzzle so that we can use it as a life sized advent calendar puzzle once December arrives. In the meantime, we've really been enjoying hiding the number pieces around our house... hunting for them... and then putting the Christmas Tree puzzle together once we find them! My kids love numbers and this project got them counting, ordering numbers, and working on their problem solving skills all at the same time. Once December hits, my plan is to hide one piece a day and let the kids find it. 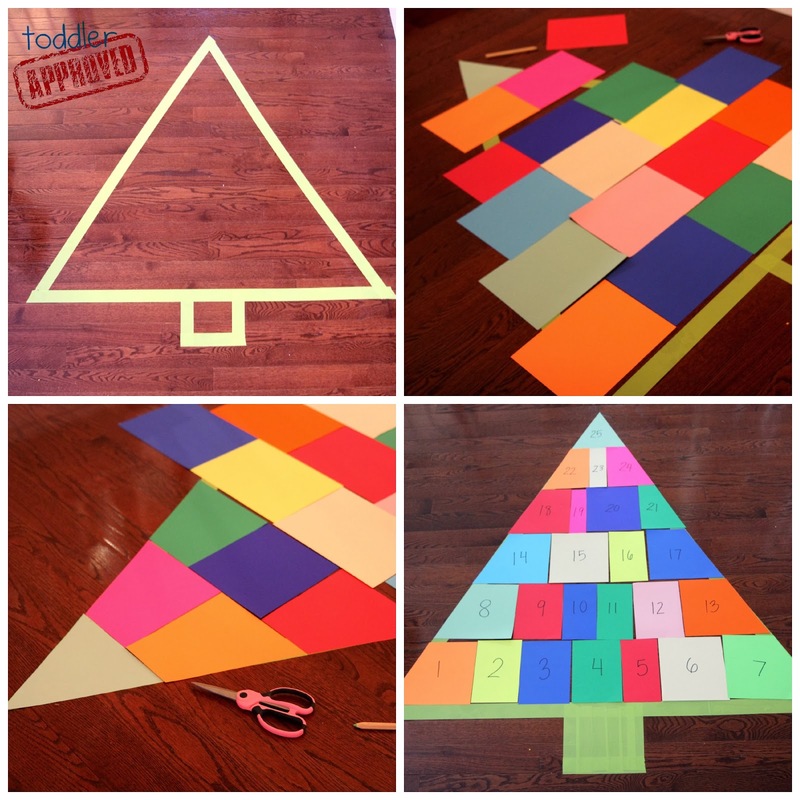 Then we'll attach it to the tree with tape and do our advent activity. 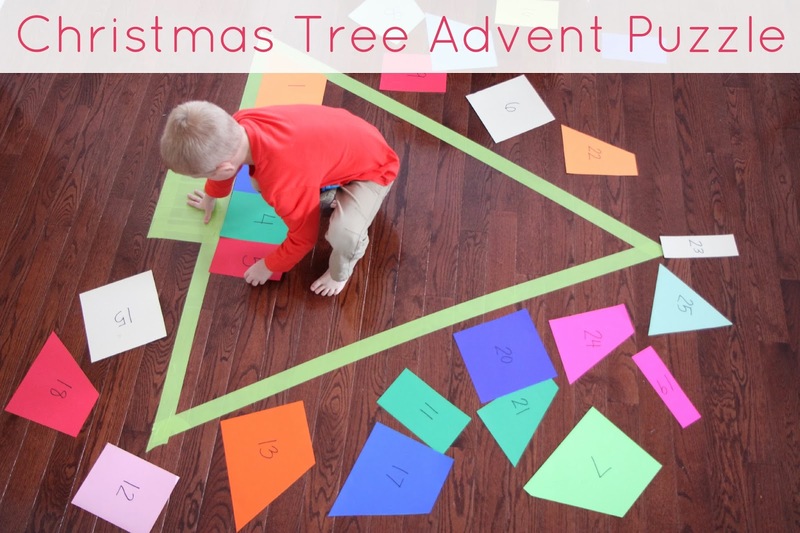 I'll make sure to read the advent activity ahead of time so that I can be prepared for it! They are already really excited. Now that we've shared some awesome DVDs and activities with you, let's announce our super cool giveaway!!! 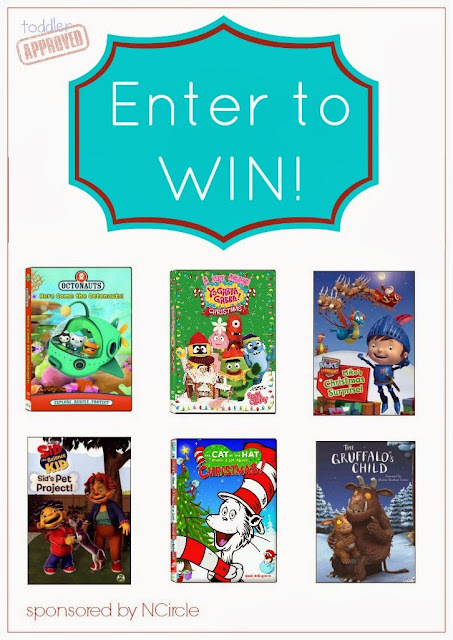 One Toddler Approved reader will win a DVD gift pack featuring all six of the DVDs shared above (and in the image below). Keep reading to find out how. You can find loads more cool giveaways and resources for kids over on NCircle's Facebook page. Keep an eye out for a big giveaway starting on December 1st! Click on over and press "LIKE" to stay in the loop. Make sure to fill in the rafflecopter giveaway entry below and complete the mandatory email entry. Make sure to use an email that you actually use... so we can contact you when you win! The winning entry will be drawn on Friday, November 29th. I will notify the winner via email. Make sure to check out our 2013 Toddler Approved Gift Guide page if you are looking for more ideas for your kids or friends! It will continue to be updated over the next few weeks. Disclosure: This post and giveaway are sponsored by NCircle Entertainment. All opinions in this post are mine! 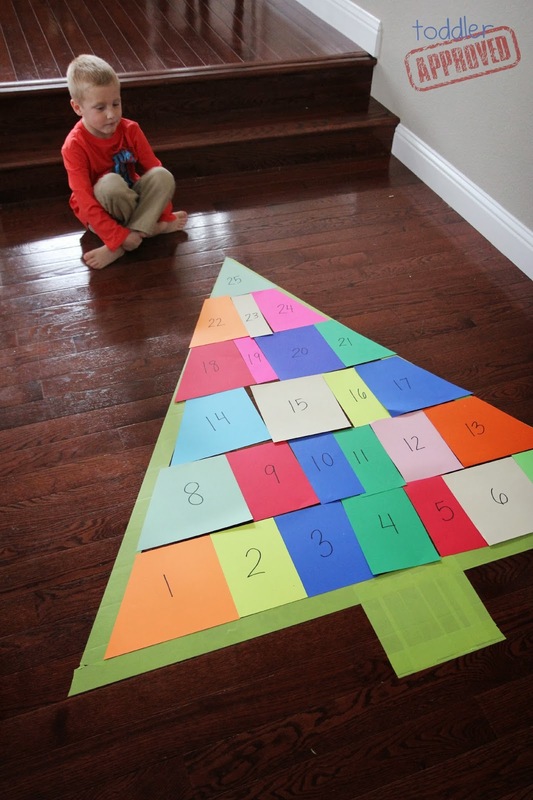 I love this giant advent calendar idea. I wrapped 25 Christmas books - some new but some from our regular collection so that we can read a different story each day in addition to some of our favorites that get ready many times during the season. What a great advent calendar! Thanks for sharing the idea! Christmas is the only time my extended family (sisters, and parents) get together now that we all are so spread apart. My favorite tradition is having us all together. I love watching my daughter get excited to see her aunts and cousin who she hardly ever sees. Last year she was more excited about seeing everyone than any of the gifts given to her. We have special activity we do everyday for advent. We love reading a different seasonal book each day! Open a game on Christmas Eve. 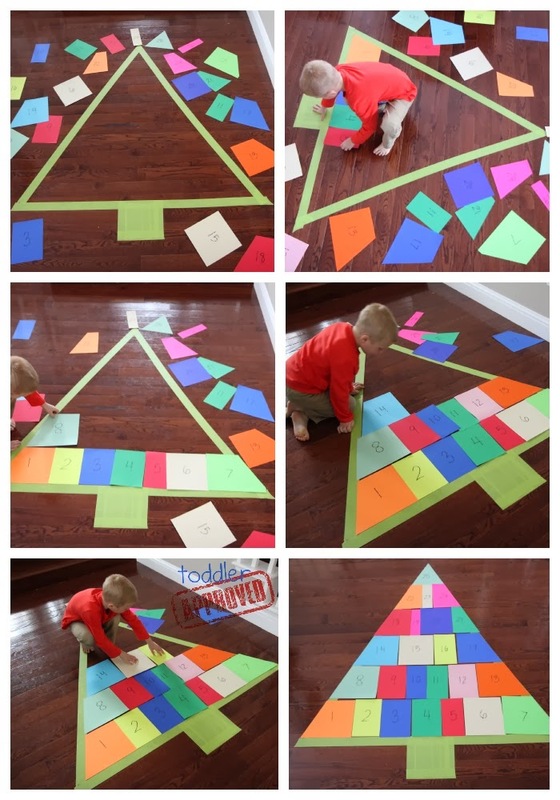 I just love this Christmas Tree Idea! I love this advent puzzle! Such a great problem-solving challenge too! We hope to start some new traditions this year. We are celebrating our son's first Christmas and we love visiting the theme parks at Christmas time. Our favorite holiday tradition is baking Christmas cookies! We put our tree up on Thanksgiving night. Then all through December we watch all the old classic Christmas movies. We also do the wrapping 25 Christmas books as an advent activity, but this year I think we want something not as centered around presents. I like this tree! Shared on FB and posted the link on the Rafflecopter! One activity we do every yr. is visit the Living Nativity at a local Church. It's outside with live animals including a camel. They do a reenactment of the first Christmas that is very meaningful! We love to go to a holiday performance every year. Last year it was the Nutcracker. This year it's the Holiday Orchestral show in the city. We always let the kids open one present on Christmas eve! My fave tradition for the holidays is baking and decorating. My favorite tradition is the family decorating the Christmas tree together! We always do some kind of Advent calander. :) I can't wait! This year is a craft one! Opening new PJ's on Christmas eve. Love to make holiday decorations with my kids! & the baking with them! We love to drive around as a family and look at Christmas lights together! Christmas tree hunting is my fav holiday tradition! Love to drive around our city & look for Christmas lights (in PJ's of course)! My favorite Holiday Tradition is putting up the tree and lights! Our holiday tradition is to drive around the night before looking at local Christmas lights. We also get to open 1 present on Christmas eve. Our family creates the dogs' Christmas costumes on Thanksgiving day. We participate in the Jingle Bell Dog Walk every year. This walk raises funds for the local shelter.